Our Spirits - Bender's Whiskey Co.
Trial and error can be a beautiful thing. Especially when it’s in the service of crafting a complex yet accessible small-batch Rye. Whether it’s balancing flavors or hauling our own Hoffmeisters to try our hands at barrel aging, we bow at the opposing altars of perfectionism and serendipity. Batch 5 is blend of five year rye and eight to nine year corn whiskey, a portion of which was finished in Hoffmeister char 1 barrels. For this batch we also lowered the proof to 90 which keeps the alcohol from overwhelming while bringing the flavor forward when drinking neat or in a cocktail. The rye gives the whiskey a sweet and spicy character with hints of cinnamon, nutmeg and molasses. The corn rounds out the pallet with sweet overtones, extending the finish at the back of the palate. We created this batch to welcome the newest member of our team, Rory Glasgow. A Scottish native, Rory has a nationally ingrained enthusiasm for whisk(e)y while also having extensive experience in marketing and the hospitality industry. In this micro-batch, we aged our spirit in a combination similar too our fourth batch. To add a fitting European edge, we finished the spirit in our French Cadus oak barrel for an additional year. This adds a pleasantly light, grassy and floral feel to the spirit, akin to a Speyside, bringing this batch into its own. On the nose, the unmistakable spice, however, slightly subtler than with previous batches, followed by faint currant fruits, a delicate floral bouquet, and the common themes of coriander and nutmeg. The front palate is presented with sweet notes of caramel and vanilla with soft velvety hints of the currants, as was obtained on the nose, coming through on the back of the palate. The light floral notes are revived as we’re given a long, grassy, oaky, and somewhat dry finish. Our whiskey already has a few years on it when it arrives at the warehouse, but we often give it another birthday before we bottle, taking parts of certain stocks and adding them to new barrels. So far we've been using new American Oak barrels from skilled barrelmaker and all-around great guy Joe Hoffmeister, who operates his cooperage out of Genevieve County, Missouri. Can't find a bottle of Bender's in your town? Purchase through one of our online carriers and get one delivered directly to your doorstep. 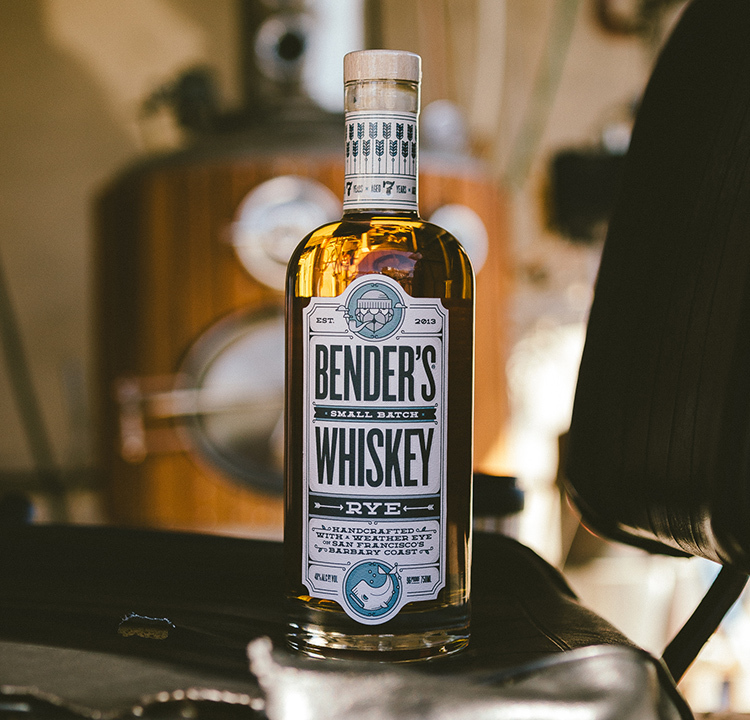 Bender's is currently available in California, Oregon, Colorado, Illinois, Washington DC, and New York. Enter your postcode below to find a store or watering hole near you. Sign up for our newsletter to hear the latest from Bender’s, including new releases, upcoming events, announcements and specials. We’re on most platforms and we'd like to keep you in loop. Join our online community and share your experiences. Connect with us today.